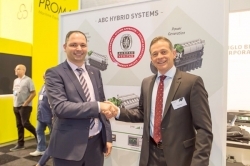 The approval, which incorporates BV’s new Electric-Hybrid notation – released in July – enables the company to offer serial hybrid propulsion systems with various options – including main engines, complete generator sets, power management systems, alternative power sources and complete propulsion packages – for workboats. Thus, ABC’s propulsion systems offer the three modes described in the new BV notation, namely, PM (Power Management mode), PB (Power Backup mode) and ZE (Zero Emission mode). The initial target applications for ABC’s hybrid systems include tug boats, utility/support vessels, pusher boats, OSVs, PSVs and more. However, through the combination of mechanical and/or electric propulsion systems (up to 15MW), the company’s products are also suitable for inland waterway vessels, coasters, container feeders, dredgers and military applications.